Hot enough where you are this summer? 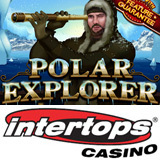 No worries -- there’s a blizzard blowing at Intertops Casino – in the new Polar Explorer slots game that is! Players travel to the frozen North Pole in this new 5-reel 25 payline slots game. Meanwhile, in honour of the Games beginning in London next week, Intertops’ $100,000 Olympics Giveaway continues to award casino bonuses and cash prizes to players. Exotic Arctic animals populate the frozen environment of Polar Explorer, and its reels sparkle with ice as the visually impressive game takes players on a journey into the snow-covered wilderness. Spinning symbols with a special snowflake pattern etched into them triggers one of three bonus games. The Hidden Treasure bonus game is set inside an icy cave brimming with extra free game Wilds, while the Explorer feature awards 5 free games where two reels show nothing but Wilds. The Discovery Feature awards 8 free spins with a Wild on at least one reel and a chance for grouped Wilds to appear. Like other games with the Feature Guarantee system, such as Aztec’s Treasure, Polar Explorer bonus spins can be triggered regardless of whether or not the trigger symbol has been spun. Beginning in July and continuing through August, Intertops Casino salutes Olympic champions with a $100,000 casino bonus giveaway, including cash prizes. The summer bonus program is one of Intertops’ biggest ever and, with prize draws for both casual and very frequent players, everyone has a chance to win. Bonuses up to $250 are being awarded twice a week and on September 3rd three players on each of six levels will win the biggest prizes of the summer. Players can check their current points and ranking any time on the scoreboard. By September 3rd Intertops will have given away a total of $100,000 in Olympics casino bonuses and cash prizes.